Well, 2017 selling is in full swing and we want to help our clients to maximize their revenue by learning the best way to sell local online advertising and, once mastered, have year after year revenue gains. Local Media Companies were able to have year after year revenue gains on their own until the Millennial generation came along and let their media choices known. Now we know that the next generation after Millennial’s, Generation Z, shows little interest in desktop, or even laptop computers opting instead to access all of their media via mobile devices such as tablets and phones. So to succeed at selling local digital along side your core media is a clear strategy for building year after year revenue gains. The first thing to do to enjoy these revenue gains, is to recognize that this is the only opportunity to continue having annual revenue gains, and then commit to this strategy; mandating that digital revenue is “your” strategy to grow your own business. 2017 is now the year of the “combo seller” according to Borrell & Associates, and providing your sales persons with a digital budget in addition to their regular budget is step 1. Of course, this creates the expectation that they will make local digital sales a priority. A key part of this, that local advertisers need to know that your sellers are knowledgeable in selling digital, and making it easy to understand and assimilate is a priority. Our company has created a one-of-a-kind targeting model meant to excel in local digital advertising, and we have comprehensive sales materials, and a Sales Discipline that makes becoming knowledgeable easy. It is fair to say that every local media company experiences some degree of an 80/20 rut. That is to say that nearly 100% of your core media sales are coming from 20% of the local prospective advertisers. Breaking out of this rut is a goal shared with us by many of our clients. In part, that is why we created our Sales Discipline. It is so comprehensive that, if followed, will produce in excess of $1,000,000 in additional digital revenue. The wildcard here is how much more of your core revenue can you add using a combo sales strategy? It is an effective way to break the 80/20 cycle. 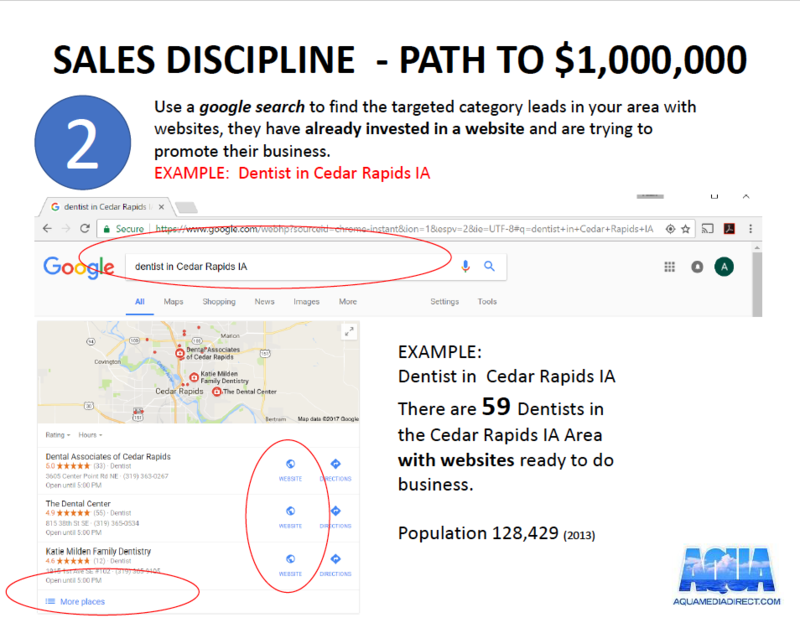 By picking 1 Media Plan per week for your team, identify leads via a search on Google such as “Dentists In Cedar Rapids, IA”. 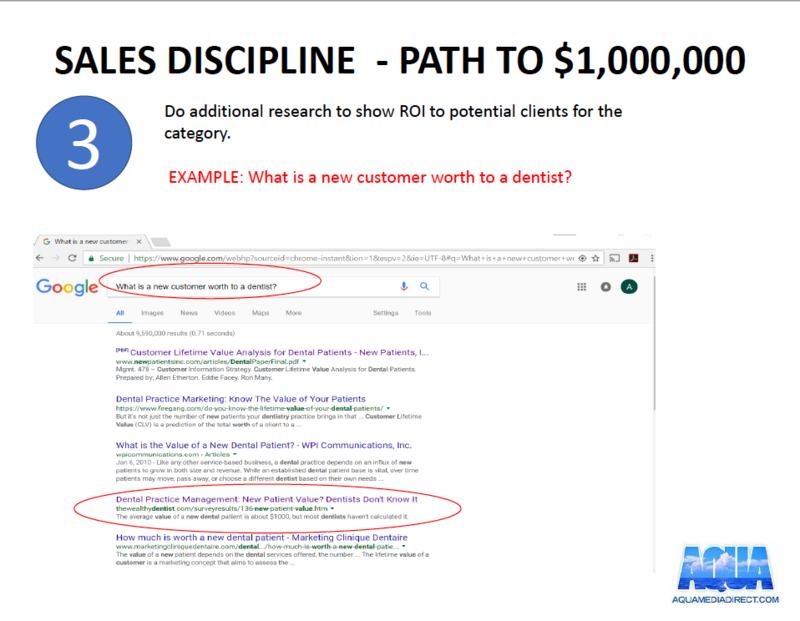 Google shows us which Dentists have websites so that we know they are already promoting themselves online. Picking 1 Media Plan per week means having to create one proposal per week, leaving more time for selling. 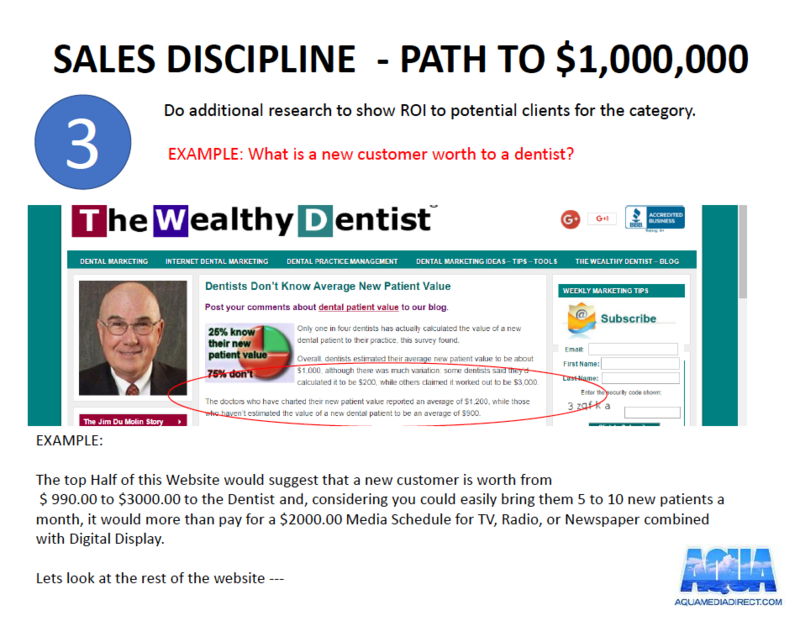 With 59 leads it is entirely possible for your team to combo sell your core media with a digital campaign to at least 3 or 4 Dentists. The next step is to create a persuasive customer needs assessment. “What is a new customer worth to a “Blank”” will always bring up information useful for this. We picked “The Wealthy Dentist” website, and were able to find great CNA information to add to our PowerPoint presentation for the week. 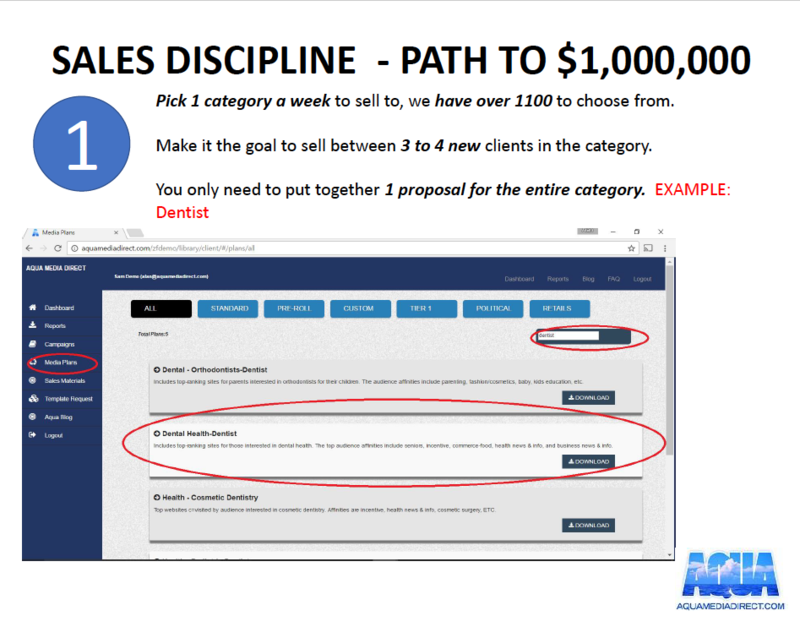 To see the whole Sales Discipline, download it from your Aqua account under “Sales Materials”. Having the Exclusive ability to sell a one-of-a-kind “Premium” local digital targeting product that has 100% Reach, 100% Viewability, and 100% Transparency is clearly a win for any Local Media Company that is serious about succeeding at selling local digital as a core business building ethic. Our “Exclusivity” makes you the only game in town to sell this superior local media product and a confident sales person should have no problem setting a premium price. Our contractual relationship comes with ownness for both parties. Our ownness is to do everything possible to make our services turnkey, and provide sales materials, and a road map to make our clients successful in selling digital revenue and having year after year revenue gains. The ownness on your side of the deal, is to make the commitment to do much more than our contractual monthly minimum of 800,000 impressions. If you follow our Sales Discipline, you will succeed in breaking your 80/20 rut with your core media by selling more of it to advertisers outside of your 20% rut, and selling way above the minimums in our contract. To summarize, we want to help. As our clients are the only persons that can see this blog, we are happy to do some advance training to help dial in your sales people to our Sales Discipline. It’s really up to you, and whether you to want to make this your strategy for building your media business to enjoy year after year revenue gains.